WOONSOCKET, RI--(Marketwired - Nov 8, 2013) - Summer Infant®, a manufacturer of juvenile products and a leader in safety items, including award-winning baby video monitors, is set to launch their latest innovative product line -- the Link WiFi™ Series of baby video monitors and internet viewing cameras -- the only WiFi system that also includes an in-home handheld video monitor. The series, that includes the Baby Touch® WiFi, Baby Zoom™ WiFi, and Baby Link™ WiFi, are home wireless network-enabled systems that allow caregivers to view baby, children, even pets, from virtually anywhere in the world. All Link WiFi systems have bank level security and use encrypted technology, providing parents with peace of mind while they are safely viewing baby at home, or away on their computer, tablet or Smartphone. "We have merged our many years of experience in the baby monitor category, with our technical expertise, and our valued consumer feedback, to develop a revolutionary WiFi monitor series," said Jason Macari, Summer Infant president and chief executive officer. "Safety and innovation are what we strive for at Summer Infant, and the Baby Touch WiFi, Baby Zoom WiFi, and Baby Link WiFi exemplify these standards." Beginning next month, Summer Infant's Link WiFi Series of baby monitors and internet viewing cameras will become widely available. The products are ideal for working parents wanting to check in on their napping child, grandparents who may live too far away to see their grandkids' everyday moments, deployed military families in different time zones, and those wanting to ensure their pets are behaving while home alone. The Baby Touch WiFi Video Monitor and Internet Viewing System is a multi-platform baby monitor system that enables in-home and away-from-home viewing. The Baby Touch WiFi camera automatically detects and connects to the home's wireless network, making for an easy installation. For in-home use, an intuitive 3.5" high-resolution color touchscreen monitor allows caregivers to control the pan, scan, and zoom, always keeping baby in view. A unique talk-back option offers the ability to speak to baby via the handheld monitor and be heard through the camera in baby's nursery. A room temperature monitor is also present on-screen to ensure a comfortable environment. A free app, compatible with Apple and Android devices is available for secure viewing from anywhere. In addition to the pan, scan, and zoom features, parents can talk-back or take pictures and record video directly from their devices. Additional cameras can be added, and parents can utilize the split-screen option to watch more than one child and even the family pet. The Baby Touch WiFi Video Monitor and Internet Viewing System will retail for $299.99; retailers can be found at www.summerinfant.com. The Baby Zoom WiFi Video Monitor and Internet Viewing System is another technologically-advanced baby monitor. It has many of the great features present in the Baby Touch WiFi system -- from simple set up, to Internet viewing capabilites and a free downloadable app. The product comes complete with a 2.5" high resolution handheld video monitor and the Baby Link WiFi camera. A list of retailers carrying the Baby Zoom WiFi can be found at www.summerinfant.com, and the product will retail for $259.99. Parents who are solely looking for Internet and mobile device viewing capabilities have the option of purchasing just the Baby Link WiFi Internet Viewing Camera. The system automatically connects to a home wireless network, enabling parents to view children in-home and away from home on Smartphones, tablets and computers via a free viewing app for Apple and Android devices. 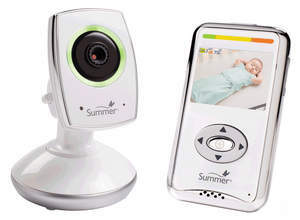 Retailers offering the Baby Link WiFi Internet Viewing Camera are listed at www.summerinfant.com, and the product will be available for the price of $169.99. At the same time, and leading into Veteran's Day, Summer Infant also announces their military 'Thank You' program, honoring military families by providing safety products -- including Internet monitors -- to soldiers who are away from their loved ones. The program kicks off with a social media campaign and a giveaway eligible to all military families. The Thank You Sweepstakes will run through November 25, and can be accessed at www.summerinfant.com/thankyou. One hundred lucky winners will be selected to receive a variety of Summer Infant's award-winning baby safety items, such as: baby monitors, including the new WiFi series, the award-winning Prodigy® Infant Car Seat, the SwaddleMe® WrapSack™ and more. Macari noted about the program, "Summer Infant is committed to keeping babies safe, while we honor the soldiers, fire fighters, police officers, and rescue workers that are busy keeping us safe. We strive to give parents peace of mind while using our products, and that includes the military families that endure hardships being away from their loved ones." For more information on the Link WiFi Series and to pre-order product, visit: www.summerinfant.com/linkwifiseries. For more information on the military program and for contest entry, visit www.summerinfant.com/thankyou. Also, check out Summer Infant at: www.facebook.com/summerinfant and www.twitter.com/summerinfant. Based in Woonsocket, Rhode Island, the Company is a global designer, marketer, and distributor of branded juvenile health, safety and wellness products (for ages 0-3) which are sold principally to large North American and European retailers. The Company currently markets its products in several product categories such as monitors, safety, nursery, feeding, gear and furniture. Most products are sold under the core brand names of Summer® and Born Free®. Significant products include audio/video monitors, safety gates, bath tubs and bathers, durable bath products, bed rails, swaddling blankets, baby bottles, warming/sterilization systems, booster and potty seats, bouncers, travel accessories, high chairs, swings, car seats, strollers, and nursery furniture. Over the years, the Company has completed several acquisitions and added products such as cribs, swaddling, and feeding products. For more information about the Company, please visit www.summerinfant.com. Summer Infant, the leading manufacturer of baby video monitors, prepares to introduce its new Link WiFi Series including the Baby Zoom WiFi Video Monitor & Internet Viewing System as seen here. The Link WiFi Series offers a simple set-up, innovative features, secure online viewing and a free Smartphone app for Apple and Android devices. Summer Infant's Link WiFi Series of monitors is ideal for working parents, loved ones living out of town and deployed military families wanting to check in on baby when they are unable to be there in person.